When Solving Quadratic Equations, What Questions Should I Ask Myself? For many learners, factoring quadratic equations tends to be among the more challenging aspects of a high school or college algebra course. The process entails an extensive amount of prerequisite knowledge, such as familiarity with algebraic terminology and the ability to solve multi-step linear equations. There are multiple methods for solving quadratic equations -- the most common of which are factoring, graphing and the quadratic formula -- and the questions you should ask yourself vary depending upon which method you use. Regardless of which method you’re using, you first need to ask yourself whether the quadratic equation is set equal to zero. Mathematically speaking, the equation must be in the form ax^2 + bx + c = 0, where “a,” “b” and “c” are integers, and “a” is not equal to zero. (See Reference 1 or Reference 2) Sometimes the equations may already be presented in that form, for instance, 3x^2 – x – 10 = 0. However, if both sides of the equals sign include nonzero terms, you need to add or subtract terms from one side to move them to the other side. For instance, in 3x^2 – x – 4 = 6, before solving you need subtract six from both sides of the equation, to obtain 3x^2 – x – 10 = 0. If you are considering this method, first ask yourself whether the coefficient of the squared term, “a”, is anything other than one. If it is, as is the case in 3x^2 – x – 10 = 0, where “a” is three, consider using another method, as it will likely be much quicker than factoring. Otherwise, factoring can be a fast and effective method. When factoring, ask yourself if the numbers you’ve placed inside the parentheses multiply to produce “c” and add to produce “b”. For example, if in solving x^2 – 5x – 36 = 0, you’ve written (x – 9)(x + 4) = 0, you are on the right track because -9 * 4 = -36 and -9 + 4 = -5. Before beginning this method, first ensure that you have a graphing calculator. If not, select another method, because graphing by hand will be cumbersome. After you have input the equation and obtained the graph, ask yourself whether the viewing window size enables you to find the solution. Graphically, the solutions for a quadratic equation consist of the x-values of the points where the parabola crosses the x-axis. Depending on the particular equation, if your viewing window is too small, you may not be able to see these points. For instance, in x^2 – 11x – 26 = 0, it is immediately apparent that one of the solutions is x = -2, but the second solution is probably not visible because it is a larger number than the standard window settings on most graphing calculators. To find the second solution, increase the x-values in the window settings until it is visible; in this example, increase the maximum value until you can see that the parabola crosses the x-axis at x = 13. 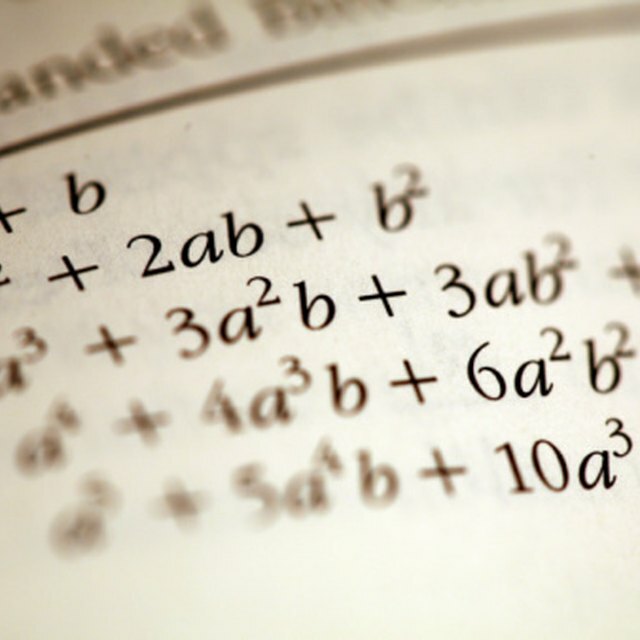 The quadratic formula method can be an effective method because it works for solving any quadratic equation, including those with irrational or imaginary roots. The quadratic formula is: x = [-b plus or minus the square root of (b^2 – 4ac)] / (2a)]. When inserting values into the quadratic formula, ask yourself whether you’ve correctly identified “a”, “b” and “c.” For instance, in 8x^2 – 22x – 6 = 0, a = 8, b = -22, and c = -6. Also ask yourself whether “b” is negative -- if so, it will be positive in the first portion of the quadratic formula. Neglecting to reverse the sign of “b” in this case is a common mistake that many students make. For instance, the example yields [22 plus or minus the square root of (-22^2 – 4_8_-6) / (2*8)]. Carefully simplify terms, asking yourself if you’re properly handling negative numbers and applying the order of operations. If following the example, you should obtain x = 3 and x = -0.25. Harris, Amy. "When Solving Quadratic Equations, What Questions Should I Ask Myself?" Sciencing, https://sciencing.com/when-solving-quadratic-equations-what-questions-should-i-ask-myself-12753465.html. Accessed 23 April 2019.